This blog will highlight some of the common questions and cool tips found in the process of transitioning our office to Revit. This site is not sponsored or endorsed by, or affiliated with, Autodesk, Inc. It's great to be a beginner again. 10 years was a good run but I have moved on to other projects. This was a nice way to start off my New Year. Let's say you have a water closet. The interior elevation mark fits fine in a 1/2" scale enlarged plan, but on a 1/4" plan the mark obscures the room. 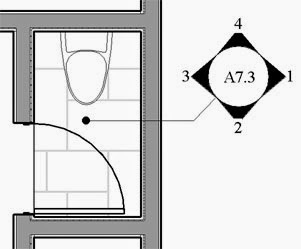 So, on the 1/4" plan, you move the interior elevation mark outside of the room and use a simple leader to indicate that that mark references that water closet (image below). Now you go back to your 1/2" plan and discover that when you moved the elevation mark in one view it moves the mark in all the views! Bummer. Duplicate the mark and hide the unwanted duplicates using... Design Options? Yes. Create a new interior elevation mark with the 4 elevations you want. Place another new interior elevation mark, this time with the "Reference other view" option checked, and choose one of the four elevations you wish to duplicate. Once placed, enable the other three views on that tag one at a time (you will be asked to reference three more views). Copy the duplicate into all the plan views that require a duplicate. Or better yet, create a new Design Option Set with two (or more) design options, select the center of the elevation mark, change the "Visible in Option" parameter for the mark from "all" to a design option... and in the view's Visibility/Graphics (or the view's View Template) set the view to display the design option as required. Notes: The focus of this example is on elevation marks, but the "Visible in Option" parameter is also available in Callouts and Sections. Also be aware that if the crop boundary in the elevation view disappears it's probably because the mark was put onto a design option. There are a heck of a lot of cool ideas out there for schedules. This post is a small fraction. 1. Need to identify what type or category of schedule you are looking at? In the Properties of the Schedule, edit “fields.” The type of Schedule is in the title of the window and the categories is often in the "Select from available fields" dropdown. 2. Is a Shared Parameter necessary? Usually when you introduce a .rfa file (ex. tag or component) a shared parameter is necessary to tag or schedule the parameter. However, Generic Annotation families do not need to have shared parameters, to populate a Note Block Schedule. In addition, a value that schedules for a system family does not need to be a shared parameter, unless you are also tagging it (.rfa). 3. Are you using a Shared Parameter in a tag or component and you're having trouble referencing it in your Key Schedules? Key Schedules will not support them. Consider FINALLY using those Hard-coded parameters that come with Revit families OOTB. They ARE available in both tags and Key Schedules. 4. Is text wrapping for your General Notes or other text (placed with the Text Tool) giving you grief? Consider creating a Key Schedule (preferably from an unused category). You will have all the flexibility of Schedules (and even access to some of the new enhancements). 5. A material is in the model but you can't find it in the Material Takeoff Schedule? 6. A material is in the Material Takeoff Schedule but you can't find it in the model? 7. Want to manage in bulk the "issue dates" for sheets or the "title on sheet" for views? 8. Want to link an Excel File into Revit? 9. 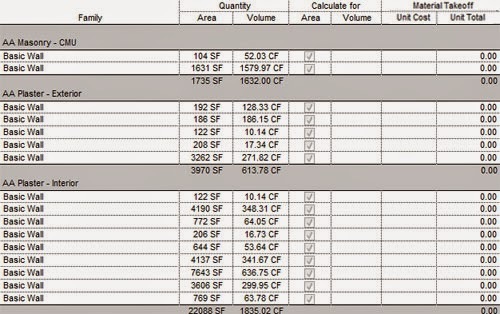 Want to Calculate Costs for Material Areas or Volumes? It's never too late to learn about Conceptual Massing, Adaptive Components and Repeaters. After an array, select an instance of the new group and then the array "dimension"
1. It's not uncommon for a family content builder to parameterize the array count and then leave the count open for the end user to flex. 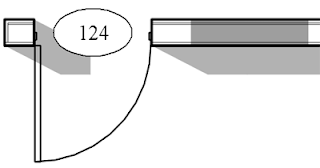 Consider adding an Optimal Spacing parameter so that when the length of the family is flexed, the spacing between shelves, muntins, rafter tails, etc. remains a desirable constant and let Revit calculate the Array Count. The designers will love you. Not good enough? For scheduling (ex. rafter tail counting) make the Array Count a shared parameter and the PMs will celebrate too. Offsetting the first and last instance of an array (toward the center of the array) with an Offset Array parameter, so that the first and last overlap in the center when the array count is equal to 1. 3. Are you getting errors when you try to model 2 arrays in the same family? 4. Are your muntins, shelves, or other crossing element arrays giving you the tic-tac-toe (#) look at an intersection? Does a join geometry not always work for you? might also be helpful for many railing family intersection challenges. I'm sure you can imagine many more uses for temporary elements. If you've ever worked on a split level home or other structure you've probably noticed that Revit won't let you freely change the grayed out level instance parameter of placed rooms the way you can with most other placed families. My workaround to this problem always involved cutting the room from one view and pasting it into a view with the desired associated level. This method usually renumbers the room creating a duplicate "not placed" room in the room schedule and usually also requires the tagging of a room again. If you'd like to keep a room number and the tag, consider grouping the room first. You should now have access to the level in your model group instance properties to re-host rooms at will. A room disguised as a group can apparently defy gravity. EDIT (05.23.2014): Luke Johnson points out that this method does assign a new element ID. EDIT (03.11.2015): Rather that cutting the room from one view and pasting it into a view with the desired associated level, which creates a duplicate room, consider deleting the room from one view and placing the same room again from your options bar dropdown of available rooms. Room Number and other parameters are still present, you lose your room tag and need to open another plan view, but you preserve your Element ID. In the example below I've grouped and pinned the as-built model... proceeded with demoing a door (infilled on the right) and wanted to show the finishes as all new on this existing wall. Phase filters wouldn't get me there, but Parts works if you're at a stage where you don't mind managing parts on a project. In this example I choose to apply a view filter (by project parameter) to get the proposed plan graphics the way I needed to for many remodel scenarios while keeping the model simple for design changes that were fluid. But in Revit 2013 I've always had to Edit Group to apply the parameters, and I've always preferred to bypass Edit Group Mode (like I can for "phase created" and "phase demolished") for a number of reasons, while still taking advantage of groups. Here is a new feature in Revit 2014 that helps to make this more possible. If you've grouped your model in part or in whole you might notice many parameters are disabled and can not be edited without first entering Edit Group mode. Well... in Revit 2014 you can now Manage.. Project Parameters... and change a setting that reads "values are aligned per group type" to "values can vary by group instance." Now TAB to an element that is part of the group and the parameters should be available to you in the Properties window. This is pretty handy if entering Edit Group mode (ex. for a large model group) every time you want to edit parameters (ex. to benefit view filters - image below) is a hassle. And for those of you with Revit MEP or the Building Design Suite... There is a very nice YouTube video on rolling offsets. 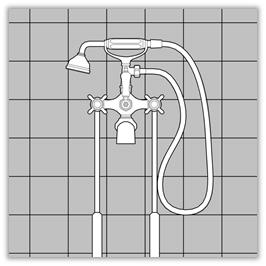 This post assumes you already have some exposure to the Parts tools or that you think the Split Face and Paint tools are the only tools available for defining scope of materials. MORE CONTAINERS: Think of the Parts tool as yet another container... an instance of a family is duplicated in two containers... (Original vs. Parts). USING SPLIT FACE AND PAINT: Parts are a nice alternative to using the split face and paint tools, a workflow that, in my experience, does not behave well with changes to the main model and other Design Option sets. Split face sketches can get deleted (or moved) and painted surfaces can, often without warning, bleed onto adjacent faces. PARTS REDUNDANCY: Create Parts from an original wall. You will end up with two walls in two separate containers (Original vs. Parts). Keep in mind that Parts, Design Options, and Phase containers are nice in that clash errors do not occur when used properly. Try using your Workset containers to study design options and you'll run into many clashes/warnings. THE BEST PARTS (no pun intended): Add the original wall to two or more design options and you will find that you can now divide, exclude, and demo parts... within Design Option containers! 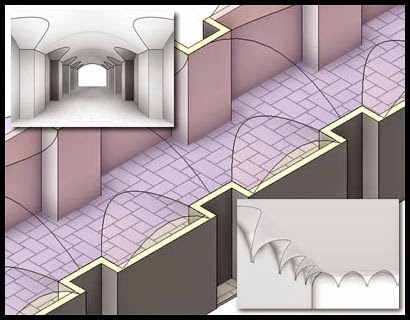 If you are just replacing the finish layer for a remodel consider dividing the finish into two parts, reshaping them both to the shape of the original... it's ok if the finishes overlap ;) and set their demo/create parameters as independent of the original. "Show Shape Handles" to change the thickness of your proposed finish. Every view can be set to "Show Original," "Show Parts," or "Show Both." Show both is quite nice when the Parts category in Object Styles is set to line weight (1) for projection AND cut and your plan view is set to "coarse". The Object Styles of Original elements will override the Object Styles of Parts "when both are present" so don't feel like you have to pick one or the other. 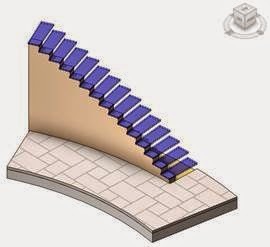 In addition, you can quantify for the area and volume of parts in material takeoff schedules, resulting in more specific takeoffs than what you would achieve in the scheduling of Original elements only (ex. separating an insulated stud layer from a non-insulated layer of the same thickness). There are many advantages to exploring the Parts container... and not just for construction modeling! I'm a Revit Beginner with an architectural office in Southern California. We design traditional, high-end residential work. I was introduced to Revit 4.5 in 2002 and am currently a member of AUGI.